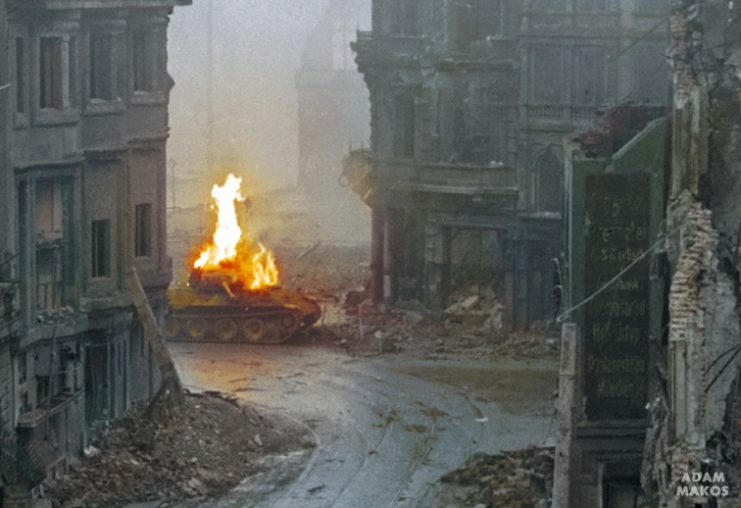 ‘Wind ‘em up!’ - The 'Hero of Cologne' Rides Sherman One More Time. 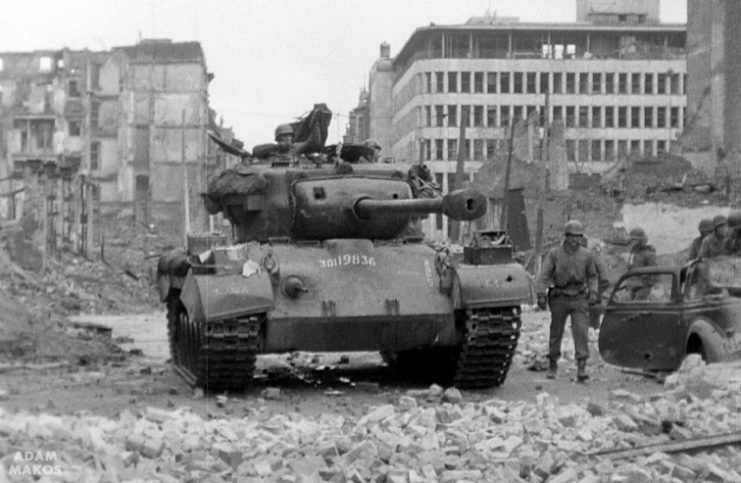 ‘Wind ‘em up!’ – The ‘Hero of Cologne’ Rides Sherman One More Time. With the customary shout of “Wind ‘em up,” the Sherman roared to life, lurched forward and then clattered down the street. If Clarence Smoyer was cold, you’d never have known it. All the 95-year-old veteran could feel was excitement. He was expecting to take an Uber to a book signing in Boston. 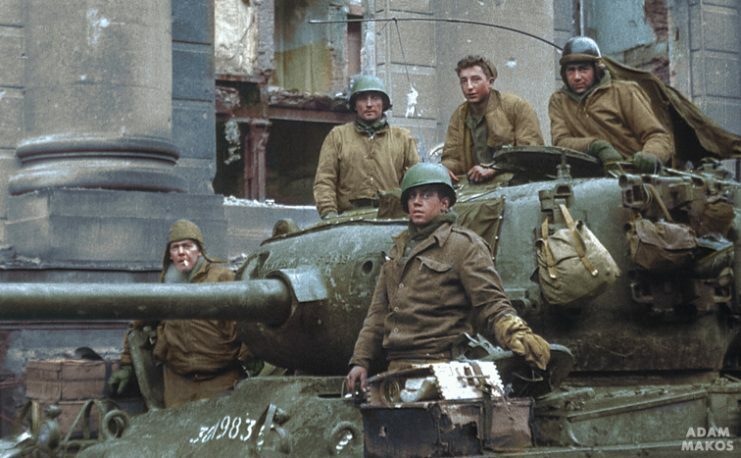 There, in front of him as he exited his hotel on that brisk winter day, was a Sherman tank – the place he called “home” for nine months in World War II. 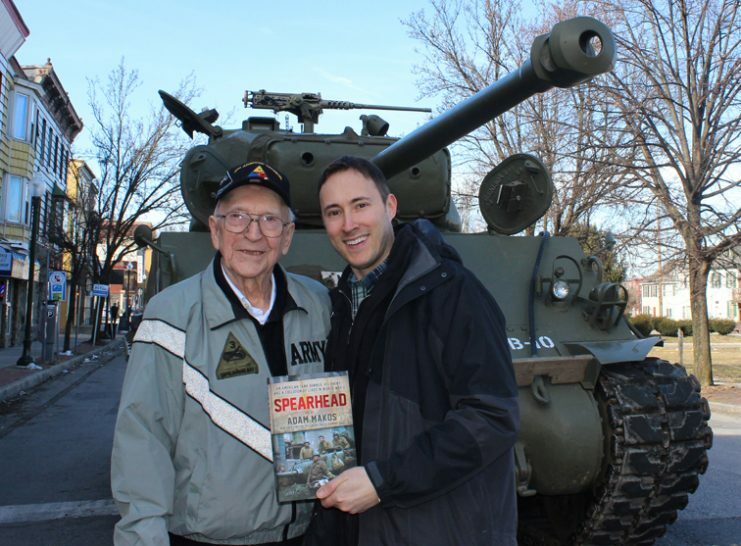 The former tank gunner got the chance to ride in a Sherman again during the Boston launch of the new book Spearhead. Written by bestselling author Adam Makos who penned the World War II classic A Higher Call, the book details Smoyer’s experiences in the closing days of World War II as he fought for his life against German Panthers and Panzers. Clarence’s tank in Cologne. Photo: Adam Makos. 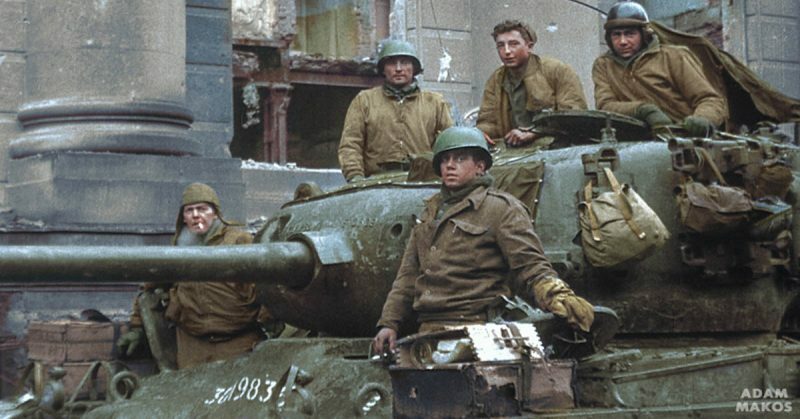 In Boston, TV crews and photographers gathered around the Sherman as Smoyer was helped up on top of the tank. 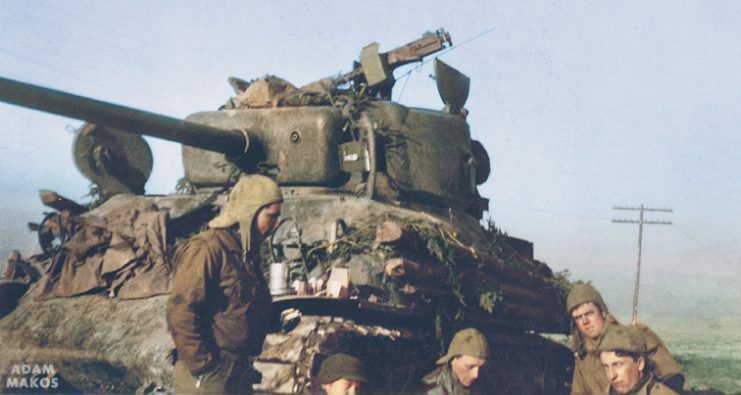 The M4A1, aptly named “Liberty,” was supplied by Rob Collings, President of the newly established American Heritage Museum in Hudson, Massachusetts. Clarence – far right corner. Photo: Adam Makos. The plan, formulated by Makos and Collings, was to have the veteran ride over to the USS Constitution Museum for the book signing while standing behind the tank’s turret, secured by a safety belt. But Smoyer was having none of that. Clarence (curly hair). Photo: Adam Makos. The crowd applauded as he climbed aboard the engine deck. Then the applause became shouts of encouragement as he approached the turret. It spurred him on. He wanted in the tank. Like a proud tank commander, Smoyer swung both legs over the commander’s cupola and sat on top of the turret with his legs dangling into the hatch. With the customary shout of “Wind ‘em up,” the Sherman roared to life, lurched forward and then clattered down the street to the museum. Smoyer’s grin was a mile wide as the tank ride transported him back nearly 75 years to a younger body and misty memories of another life. Smoyer served in the famous Spearhead Division, the 3rd Armored Division commanded by Major General Maurice Rose, which fought at the Battle of the Bulge, Cologne and other key engagements. His unit got its nickname because it usually led the attack through enemy lines. Panther burns in Cologne. Photo: Adam Makos. Smoyer saw World War II through two different gun sights. He blasted away at enemy targets from the M4A1 Sherman and then the M26E3 Pershing, which featured a powerful 90mm cannon. He was one of the first to fire the more technologically advanced Pershing in combat. 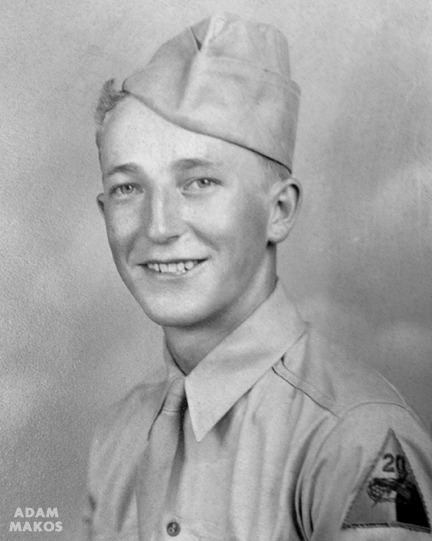 Smoyer became perhaps America’s most famous tank gunner during the Battle of Cologne. His duel with a deadly Panther was filmed by a combat photographer and played on newsreels across the country in 1945. Firing from the Pershing, he destroyed the German tank after it had taken out two Shermans in close-quarters street fighting. Clarence rides the tank through Allentown. Photo: Adam Makos. But Smoyer wasn’t free of the Panther’s shadow just yet. There was still the “Nazi Fort Knox” waiting for him. After a record-busting 100-mile drive behind enemy lines, the Spearhead Division set its sights on the German city of Paderborn, the home of the armor schools for both the Wehrmacht and SS. Battle-hardened instructors in Panthers and Tigers were waiting for Smoyer and his company to cross an open field and fight in the twisted tangle of the railroad station, the climatic setting for one of the last armor clashes on the Western Front. And there, in the war’s last days, Smoyer found himself in a running gunfight with another Panther – and the most formidable enemy crew he’d faced yet. Clarence meeting Gustav. Photo: Adam Makos. The scars and memories would be hard for Smoyer to shake. 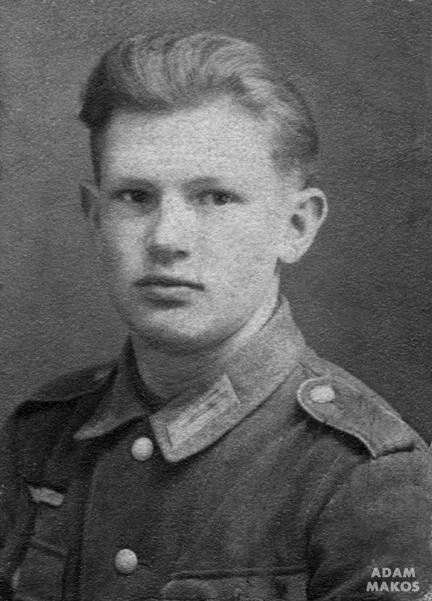 In 2013, he’d journey to Cologne where he’d reunite with Gustav Schaefer, the German tank gunner he’d fought against. Makos accompanied Smoyer back to the city of his nightmares. “The noted German documentarian Hermann Rheindorf had tracked down Gustav’s identity and whereabouts, leading to this reunion,” the author said. For his part, Smoyer is enjoying the book tour and his newfound celebrity. He has been interviewed by scores of journalists while videos of him riding the Sherman tank have been broadcast nationwide. And the Boston attention has led to further adventures. 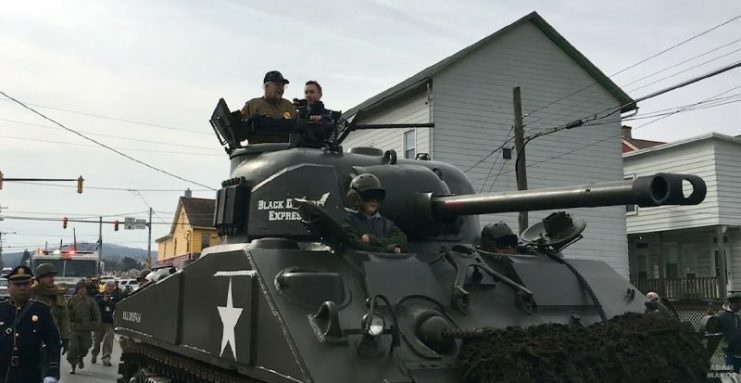 His hometown of Allentown threw him a parade, and Smoyer – nicknamed “Tank Guy” by a local newscaster – once again climbed aboard a Sherman for a ride to his neighborhood VFW. This M4A3 Sherman, named “Black Diamond Express,” was supplied by John Rich Sr. of the JWR Museum and driven by his son John Rich Jr.
Spearhead cover. Photo: Adam Makos. After the ride through crowds of flag-waving supporters, Smoyer was led to a podium where he became choked up before the appreciative crowd. “I’m overwhelmed,” he said. “This is the greatest honor.” For a veteran who never thought he’d live through the war – let alone enjoy this attention – he now hopes he can channel his newfound fame for a higher cause. Clarence Adam Spearhead. Photo: Adam Makos. Read another story from us: Firing The .50 Cal From a Sherman Tank: How Often Was This Actually Done? “I hope people who read this book will understand what the fellas went through during the war. War is hell. War is hell,” Smoyer said. 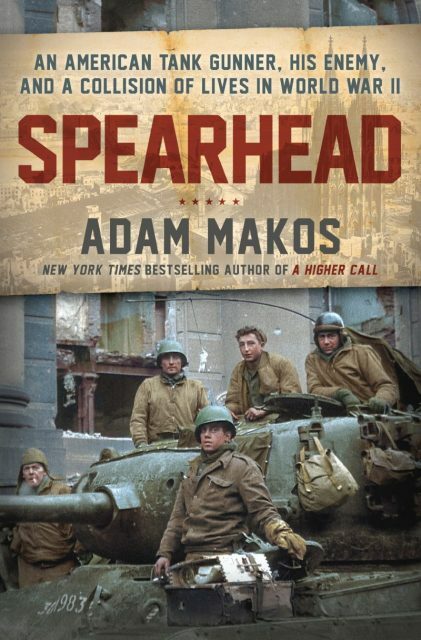 “Spearhead: An American Tank Gunner, His Enemy, and a Collision of Lives in World War II” was published by Ballantine Books and it’s already a New York Times bestseller. It is available for purchase online or at bookstores nationwide.